There’s hope for people whose seizures are not well-controlled or who have side effects from medications. The expert, specialized care provided by epilepsy centers can help people with seizures and epilepsy reach the goal of No Seizures, No Side Effects. Continuing to have seizures despite treatment for more than one year? Continuing to have seizures despite treatment with two different medications? Pregnant or want to become pregnant? If you answer yes to one or more of these questions, you should seek care at an epilepsy center. 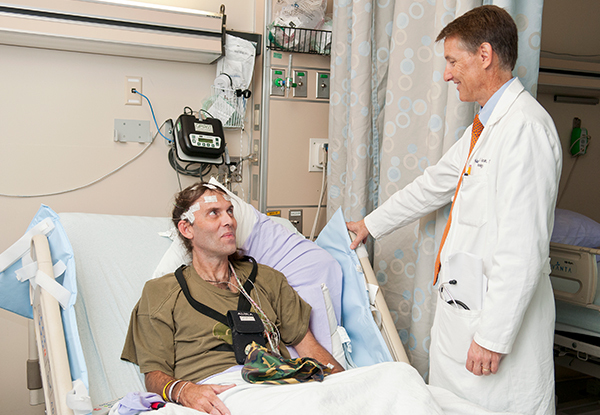 Epilepsy centers provide a comprehensive team approach to the diagnosis and treatment of epilepsy, which includes many different types of doctors and other providers who are experts in treating epilepsy. A patient-oriented team will typically include epileptologists (neurologists with expertise in treating seizures), neurosurgeons, neuropsychologists, nurse specialists, EEG technologists, social workers, and others with training and experience in epilepsy centers. Advanced testing to confirm an epilepsy diagnosis or find another cause for your symptoms. A team approach to coexisting medical conditions including depression, learning disabilities, anxiety, and more. Non-medication therapies including epilepsy surgery, the ketogenic diet, and neurostimulators. Seizures secondary to genetic disorders or other rare epilepsies. Education about effects of epilepsy and seizure medications on pregnancy and the developing baby. Information about clinical trials of new experimental drugs or devices for seizures. Use the My Seizures Know More tool to answer six questions about seizure control, social and psychological concerns and other issues that affect your health and quality of life. You can print or email a personalized report with your responses, which can be shared with your doctor to determine if you need to change your treatment plan or be referred to an epilepsy specialist or center.